An easy, no-cook appetizer to serve for your holiday parties. This Pear Crostini with Joan of Arc Traditional Goat Cheese pairs well with wine and is a must have in your easy holiday entertaining menu. The busiest season of the year is almost here. The holiday season. The season for entertaining, hosting parties and attending parties and dinners with friends, families and loved ones. Every one wants to be that host who has loads of food ready, that the guests will never go hungry. But to be honest, it can end up being a little bit stressful to prep and make all that food, especially if it is not a small gathering. For such kind of entertaining, I always recommend a no-cook, easy appetizer, that you can assemble at the very end or even just assemble and few and let the guests do it for themselves later on. A cheese plate is always a great appetizer, but everyone does it. Its nothing new. But you still want some cheese and fresh fruit as a light appetizer, that will go well with the wines you are serving. To make an appetizer with cheese, a spreadable cheese like Joan of Arc Goat Cheese is perfect. The ideas are innumerable. 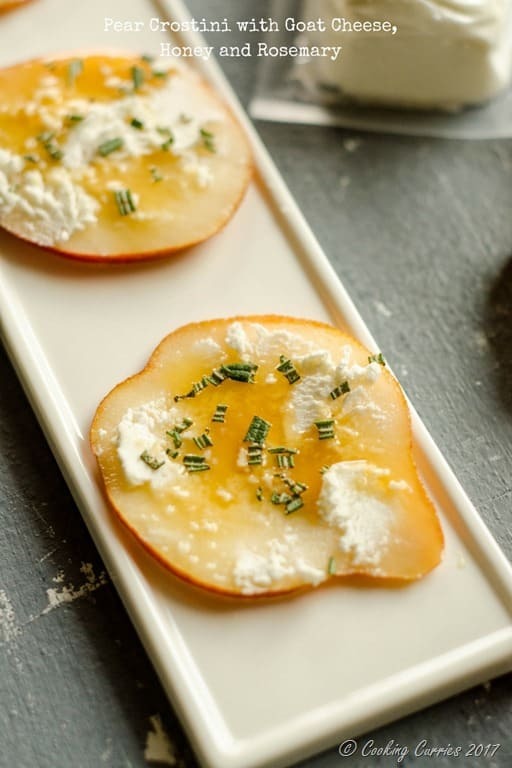 This Pear Crostini with Joan of Arc Goat Cheese, some honey drizzled over it and a sprinkle of rosemary and sea salt, is an appetizer like no other. Every bite is an explosion of taste and this is exactly the kind of appetizer that you can just keep the components set up and the guests can assemble it themselves. For this Pear Crostini, I used Joan of Arc Traditional Goat Cheese. You can also put out Joan of Arc Bruschetta Goat Cheese and Joan of Arc Fine Herb Goat Cheese and some baguette and a few other toppings to create a few more easy to assemble appetizers. Arent you excited for the holidays? I sure am! 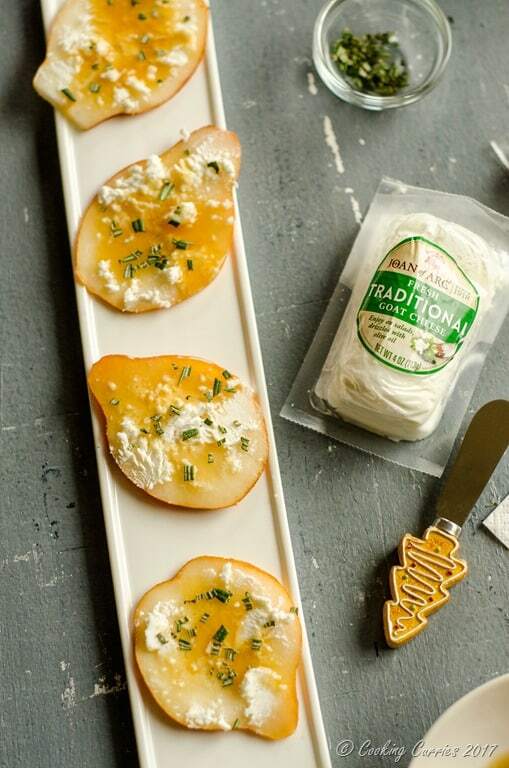 On each pear slice, spread a little of the goat cheese. Drizzle some honey over it and sprinkle some rosemary and sea salt. Serve as an appetizer with wine. Love this recipe? 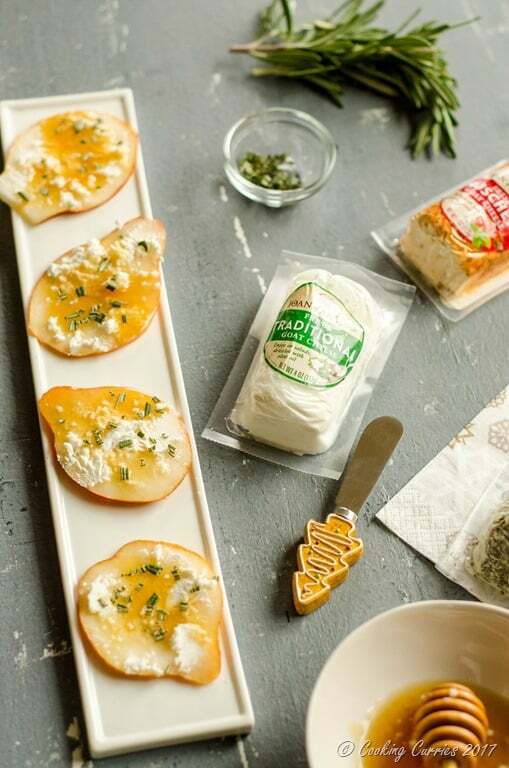 PIN IT to your Holiday Entertaining or Appetizer boards to save for later!